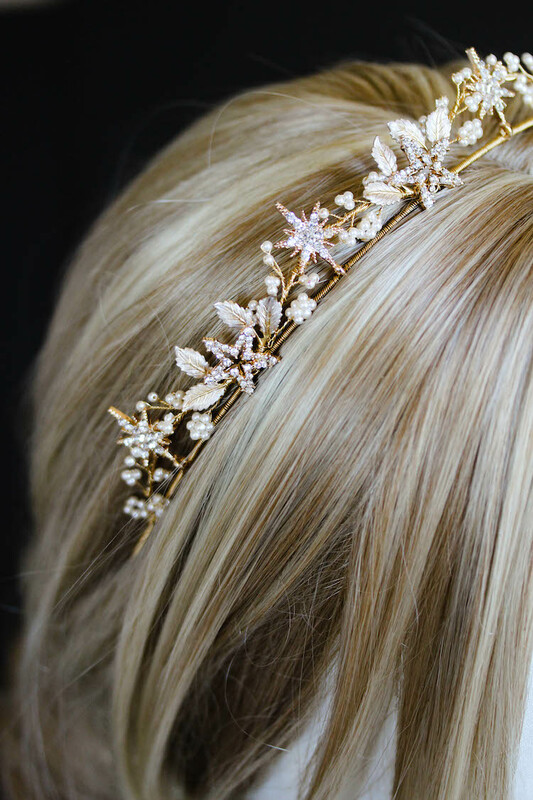 A little while back I had the wonderful opportunity to create a rose gold bridal headpiece for bride-to-be Madeliene. I adored working with Madeliene to design her pretty piece in soft blush tones. As inspiration for her piece, we looked to her favourite piece in the collection – the Giselle bridal headpiece – and I customised her design in a longer and wider size, using rose gold wire and finished with lots of blush toned Mother of Pearl flower details. As per Madeliene’s likings, I sparingly incorporated pearls in her piece and focused on crystal detailing with a scattering of blush accents. Rose gold has been such a popular tone over the past few wedding seasons and I don’t see this changing any time soon. Romantic, sweet and oh-so-feminine, golden rose tones will surely be around for many more seasons to come. If you love this piece and you’d like a rose gold headpiece designed just for you, feel free to get in touch. I would absolutely love to hear from you. Let’s create something beautiful!